Precious birthstones protect us throughout our journey reminding us that we are our very own transformation stories. 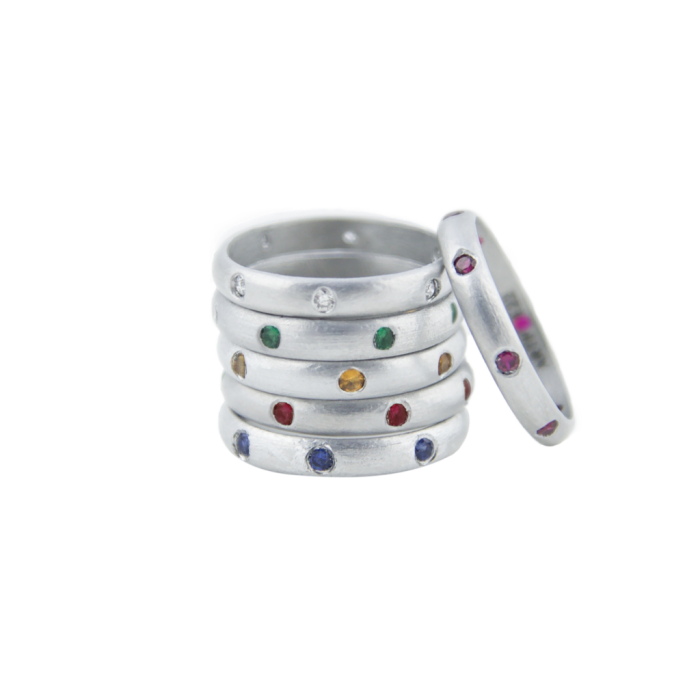 Each of the 7 birthstones is embedded in our signature metal. Each piece gives back to support traditional Laotian artisan livelihoods, village development, community endeavors and further de-mining efforts. Your purchase contributes to MAG (Mines Advisory Group) to safely & expertly clear some of the 80 million unexploded bombs contaminating land in Laos. Ring Measurement : find your match using our RING SIZE GUIDE to ensure you’ve chosen the right ring size. We recommend measuring the interior diameter of a ring you already have. Every gem supplied to ARTICLE22 is certified conflict-free and each gem Order made is recorded by us to reflect this. Our supplier has earned certification from the Responsible Jewelry Council, verifying they are in compliance with the Kimberley Accord and that the stones, as well as the the supply chain, meet the high standards of the RJC Code of Practices. Comes complete with ARTICLE22 story card and handwoven black silk pouch. Hand cast re-purposed military grade aluminum – our PEACEBOMB Al metal includes Vietnam War era bombs, plane parts, military hardware and other aluminum scrap. East meets West. Each PEACEBOMB Al piece is authentically handcrafted in Laos and finished in Vientiane or New York. PEACEBOMB Al does not have to be removed in water. Bangles can be worn constantly. Metal does not tarnish. With wear, each piece becomes uniquely yours and may acquire a polished patina from the natural oils of your skin. Gem + Jewel is proud to offer FREE 2-3 day shipping on all orders over $100. Orders under $100 can be shipped using ground or express shipping methods, all at an additional charge. All shipment methods are business days only, and exclude weekends and holidays. At Gem + Jewel, we take pride in providing extraordinary pieces with the best service available. All products purchased through GemandJewel.com are shipped directly from the manufacturer, and are guaranteed to be 100% authentic. Items returned to Gem + Jewel, or any of our authorized retailers, are extensively examined by our certified gemologists and jewelers to further guarantee authenticity. Are first quality, containing all original parts and guaranteed authentic. Have the original manufacturer’s serial number intact. Are not refurbished, factory seconds, or replica products.